Download the PDF version (573 KB) of this content. Outlook: Logging activity declined over the past decade as a result of weakened downstream demand for pulp and paper. However, there has been a recovery as Western Canada's wood product exports to the US increased by 43% between 2014 and 2016.Footnote 7 This recovery may be short-lived as a result of recent wildfires in Northern Alberta (2016) and BC's Cariboo region (2017) that have eroded the timber supply. Supply: Canadian forests contain approximately 47 billion m³ of wood. BC's coast is home to Canada's fastest growing forest with 432 m³/hectare in wood volume – three times the national average.Footnote 8 The combined effects of rising temperatures, higher rainfall and carbon dioxide have led to a “fertilization effect” which is accelerating the growth of trees in in BC's high-latitude forests. In 2014, BC harvested 43% (66.5 million m³) of Canada's total wood. Alberta contributed 15% (23 million m³).Footnote 9 Wood volume is used by professional foresters to determine sustainable harvest levels for timber production.Footnote 10 However, wildfires and pest damage have eroded supply. Consequently, shortages are anticipated. Since the mid-1900's, the US has been the most important buyer of Canadian lumber. There is a strong correlation between the US housing market and the health of the Canadian forestry sector. However, in the 1980's, the US government began placing tariffs and restrictions on Canadian lumber producers to protect US industries. In 2006, the US-Canada Softwood Lumber Agreement (SLA) was signed imposing export charges when lumber prices fell below a pre-determined level. Following the expiry of the SLA in 2015 and unsuccessful negotiations on a long-term settlement, the US Department of Commerce released its final determination of anti-dumping (AD) and countervailing duties (CVD) on Canadian softwood lumber imports in November 2017. The new tariffs on exports to the US average 21% for most Canadian producers. However, in the wake of hurricane damage in Texas and Florida in August 2017, US demand for softwood lumber construction material is expected to spike, along with composite prices which bodes well for the sector. Additionally, in January 2018, the U.S. Secretary of commerce announced preliminary tariffs on uncoated groundwood paper imported from Canada, determining that exporters from Canada received countervailable subsidies ranging from 4.42 to 9.93 percent. As a result of decades long ongoing trade disputes with the US, lumber producers in Western Canada have diversified their export markets. Since the 1990's BC has fostered new markets in China. Between 2015 and 2016 the US market share of forest product exports from Canada declined 13%, from 81% to 68%.Footnote 20 The BC government is trying to further diversification by promoting sales to India.Footnote 21 Major Canadian forest companies have also expanded production into the US making them less vulnerable to unfavourable trade actions going forward. Note: The GDP percentage includes forestry and logging and support activities for forestry. The percentage of total employment number includes forestry and logging and support activities for forestry. The main occupations in forestry and logging based on an occupation-industry matrix are labourers, (NOC 8616, 9614), tradespeople, machinery and equipment operators (NOC 8241, 8421, 9431, 9434, 9437), graders (NOC 9436), managers (NOC 8211, 9215), and professionals (NOC 2122, 2223, 8211). Logging is employing fewer chainsaw operators (8421) and more machine operators (8241, 9431, 9437), resulting in the need for higher levels of knowledge and skills, especially computer skills. Between 2006 and 2016, employment in forestry, logging and support activities grew by 38% in Saskatchewan, 14% in Manitoba, 11% in Alberta, and declined by 11% in BC. 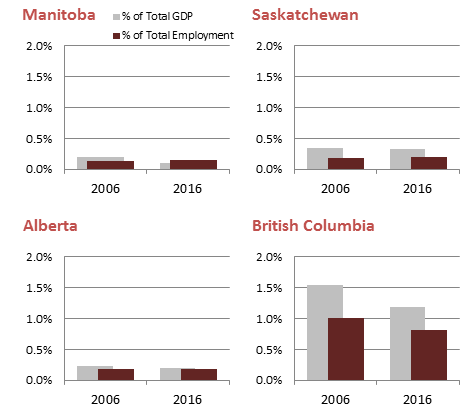 Among the Western provinces, forestry and logging employment growth between 2017 and 2019 is expected to be modest in Alberta and Saskatchewan (0.8% and 0.4%, respectively. However BC, the mainstay of the sector, is expected to see significant decline over the forecast period (-1.9%). Employment in Manitoba is also expected to be weak (-2.4%). From an economic region perspective, employment growth is forecasted to be strongest in Calgary and Southern Alberta (1.5%). 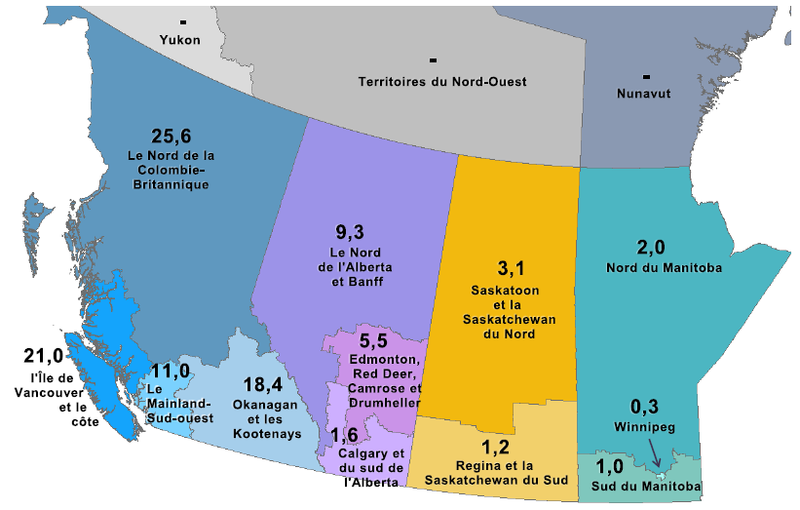 Saskatchewan regions will see a modest increase in employment (0.3% to 0.4%). Manitoba's small forestry and logging workforce is forecast to decline, particularly in Northern Manitoba (-3.4%). All of BC's regions are likely to see a decline in employment (-1.3% to -2.3%). Vancouver Island & Coast and Northern BC will bear the brunt of the decline (-2.3% and -2.1%, respectively). Vancouver Island & Coast: According to a survey by the Truck Loggers Association, optimism in BC's coastal forest industry has been in decline for over 10 years. Furthermore, in April 2016 Vancouver Island communities voted to seek a total ban on old growth harvesting on Crown land citing old growth as a tourism resource. Lower Mainland & Southwest: This region has historically been one of the largest centres for forestry related employment in Canada. Two of the nation's largest forest product companies, Canfor and West Fraser Timber, are headquartered in Vancouver. Northern BC: Forestry is vital to the economy in northern BC. A number of small towns rely on good paying jobs in areas where employment opportunities are limited; however, layoffs have been common over the past decade negatively impacting many small communities in the North. In addition, the 2017 wildfires in BC's Interior seriously eroded the lumber supply. The impacts will likely be felt in 2018 going forward. Northern Alberta: The 2016 wild fires in Fort McMurray area are expected to have a long-term effect on the logging industry. The burning of mature timber impacted downstream mills and employment. Saskatoon & Northern Saskatchewan: The forest sector is northern Saskatchewan's second largest industry, generating over $1B in sales annually. Note: Vancouver Island and Coast and North Coast regions are part of the Pacific Maritime Ecozone with 4.6B m³ of fastest growing forests. BC's Thompson-Okanagan, Kootenay and Cariboo regions are part of the Montane Cordillera ecozone with 7.8B m³ in wood volume. Nechako and Northeast region are part of the Boreal Cordillera ecozone which stretches into the Yukon with 2.3B m³ in wood volume. Natural Resources Canada. (September 22, 2016). State of Canada's forests report.